A new paper involving Environment Institute members Thomas Prowse, Corey Bradshaw (also SARDI), Michael Watts and Barry Brook as well as Christopher Johnson (University of Tasmania), Robert Lacy (Chicago Zoological Society) and John Pollak (Cornell University) has recently been published in the Journal of Animal Ecology. 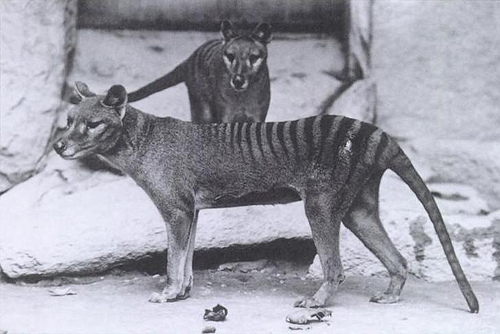 The paper titled ‘No need for disease: testing extinction hypotheses for the thylacine using multi-species metamodels’ designed a new population viability approach (PVA) that includes species interactions explicitly by networking species models within a single ‘metamodel’. Population viability analysis (PVA) is used to assess the extinction risk of threatened species and to evaluate different management strategies. However, conventional PVA neglects important biotic interactions and therefore can fail to identify important threatening processes. This study demonstrates the utility of PVA metamodels by using them to reinterpret the extinction of the carnivorous, marsupial thylacine Thylacinus cynocephalus (Tasmanian Tiger) in Tasmania. In particular, they test the claim that well-documented impacts of European settlement cannot account for this extinction and that an unknown disease must have been an additional and necessary cause. Read the paper to find out more. This entry was posted in GEL, News, Publications and tagged Barry Brook, Christopher Johnson, Corey Bradshaw, extinction, John Pollak, Journal of Animal Ecology, Michael Watts, population, PVA, Robert Lacy, Tasmanian Tiger, Thomas Prowse. Bookmark the permalink.